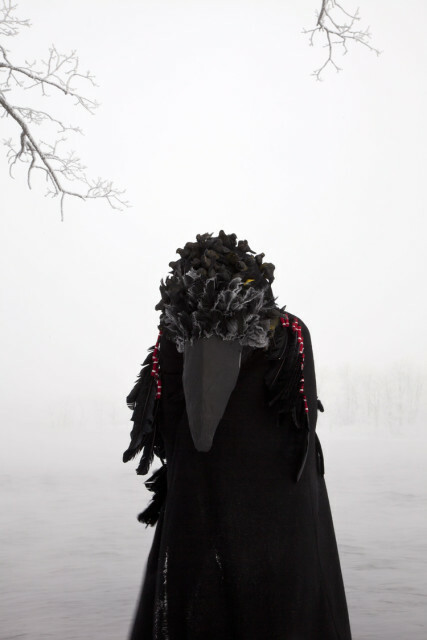 Meryl McMaster is an Ottawa based artist of Plains Cree/European decent. Her photography explores questions of how our sense of self is constructed through land, lineage, history, and culture. Her distinct approach to photographic portraiture and self-portraiture incorporates the spontaneity of photography, the manual production of objects or sculptural garments that she creates in her studio and performance. In her works, these media form a mosaic that illustrates a journey of self-discovery as she explores the tensions complicating our understanding of personal identity. Her work invokes a sense of the otherworldly, transporting herself and the viewer out of ordinary life and enlarging our understandings of inherited historical narratives.